Stress fractures are usually caused by fatigued muscles, overuse errors, training errors, bony malalignment or improper biomechanics, not weak bones. Occasionally weak bones may play a role in stress fractures especially in amenorrheic female athletes and in rheumatoid patients. When the intrinsic musculature of the foot is fatigued the support structure of the mid foot is reduced which may result in stress fractures. Pain is along the dorsal (top) bony middle aspect of the metatarsal shaft, not in soft tissue. 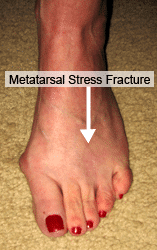 Medial stress fractures (second and third metatarsal shafts) are usually seen in a pronated or a flat foot and lateral stress fractures (fourth and fifth metatarsal shafts) are usually seen in a high arched or a supinated foot. The proper diagnosis can be difficult because the fractures may not show up on x-ray for up to a month. Finding a qualified physician is important. For the first 4 – 6 weeks the patient is treated with a postoperative shoe or cast. After this time a custom molded orthotic to balance the biomechanics of the foot is prescribed. A carbon fiber foot plate to limit motion within the foot may also be prescribed as well as a decrease in activity.